“Tabiat” (nature) is a newly constructed pedestrian bridge in the north of Tehran with 270 meters length, designed by a young Iranian architecture, MS. Leila Araghian. Some believe that the designer has been inspired by old Persian bridges especially the Khajou Bridge. All the three levels of the bridge are connected by stairs and the whole bridge sits on tree-shaped steel columns. Being built in 2014, Tabiat Bridge won several architectural awards, like A+awards and Aga Khan Award and became very popular among the citizens of Tehran, quickly. 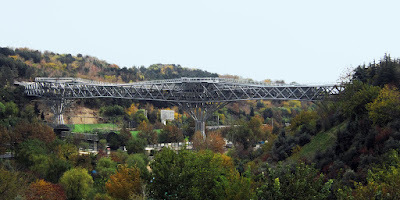 This bridge passes over Modares Highway and connects to vast public parks of the city (Taleghani and Ab o Atash). "Tabiat Brdige" or "Nature Bridge" in Tehran. “Tabiat Bridge is not only a path to pass but a place to stay.” The designer says. 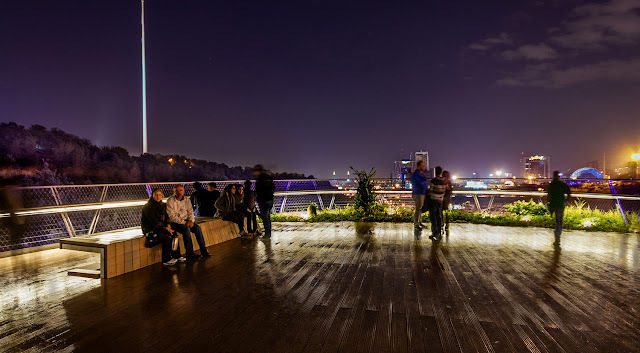 The café-galley, the restaurant and the well-designed benches have made Tabiat bridge a good hangout for the citizens and tourists in Tehran, where they can enjoy the beautiful landscapes of this modern city and the green parks while walking on the wood paths or chilling in the café or the restaurant. Visiting this architectural masterpiece, enjoying the landscapes and meeting the local people of Tehran is a good choice to finish your Tehran Day Tour in the afternoon. People hanging out on the "Nature Brdige".